Howard Lee Kane, age 40. Place killed: World Trade Center. Resident of Hazlet, N.J. (USA). Having struggled with Crohn’s disease, an intestinal illness, for most of his life, Howard Lee Kane had little patience for anyone in a bad mood. His tonic was laughter, and whether it was a new joke he would e-mail to friends or a funny story about that day at the office, he had the gift to make people smile. Mr. Kane, 40, was the comptroller at Windows on the World, a job he loved, said his wife, Lori, because it combined his passion for cooking with a view he called “halfway to heaven.” Mr. Kane, who lived in Hazlet, N.J., put in long days that began at 4:30 a.m. He commuted more than an hour each way. But his only complaint about work, his wife said, was that he lacked the words to describe the sunsets and view. As I was doing research on Howard, I did a Google search on his name. There were 16 pages of references. It occurred to me that this was not the way I’d want to have my name remembered, as one of a list of victims of a horrible attack. Howard wasn’t given a choice in the matter. A Legacy guest book for Howard has six pages of comments for the family. Some were folks who knew him in high school. Some were folks who knew him through business. Some were folks who didn’t know him at all, but wanted to express their condolences to his family. They speak to a man who touched others and truly left a legacy. I would see Howie, or more commonly referred to as “Nugget’s Daddy” by my youngest daughter, almost every night in the warmer weather. He was so kind and patient with the children, always stopping with his dog, Nugget, and allowing the children to sit and let Nugget jump in their lap. Although I only knew Howie to say” hello”,I will miss seeing him on Kildare Drive. Blessings on the family and friends of Howard Lee Kane. To see the whole list of 3,173 3,311 bloggers commemorating the 2,996 9/11 victims, visit D.Challener Roe’s site. Thank you, Dale, for coordinating this effort. Profile published in THE NEW YORK TIMES on November 20, 2001. 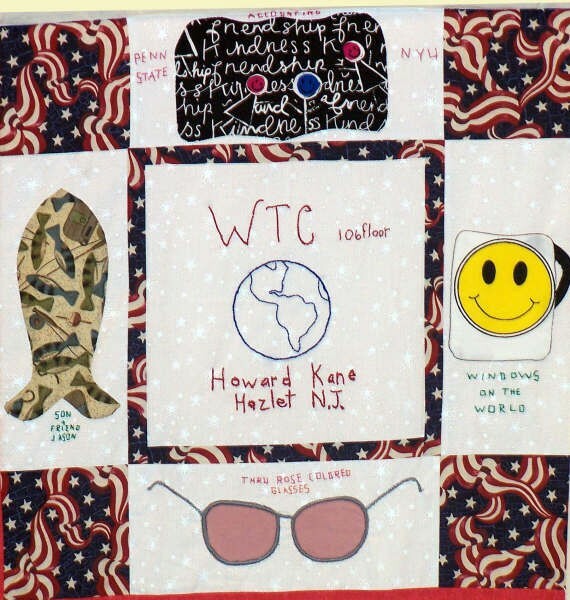 United in Memory has created quilt blocks to commemorate each victim. Thank you for this fine tribute. Howie was our next door neighbor and even though we didn’t get to see him too often, we did get to say hello when he was tending to his property or while he passed our house while walking his cute little dog “nugget”. He was a very nice guy. Howie was not the only person we knew who perished during that horrible event, we knew several others and continue to pray for them. Our hearts go out to the families….our hearts go out to Lori and Jason. God Bless.